Sydney Collier and Wentworth. Photos (c)SusanJStickle.com. Lexington, Kentucky – July 19, 2015 – The United States Para-Equestrian Dressage Young Rider Team made history at the inaugural 2015 Adequan/FEI North American Junior Young Rider Para-Dressage Championships (NAJYRC). The U.S. team topped three days of competition at the beautiful Kentucky Horse Park, earning the win over Canada on July 18. The team included Sydney Collier (Ann Arbor, Mich.) and her own Wentworth in Grade Ib; Cambry Kaylor (Lehi, Utah) with her own Markgaards Donnewind also in Grade Ib; and Kate Shoemaker (Glendale, Ariz.) and her own Pacifec M in Grade III. The team was led by Chef d’Equipe Kai Handt and Team Coach Wes Dunham. Equestrians competed on July 16, in the Team Test followed by the Individual Test on July 18. The USA topped the Canadian Para-Dressage Team with a lead of 393.02 over 380.191. Following the medal ceremony and some celebration, the USA Team regrouped for their Freestyle Tests on Sunday, July 19. In addition to topping the first-ever NAJYR Para-Dressage Championships, U.S. athlete Sydney Collier was awarded the The Captain Andrew B. de Szinay Memorial Sportsmanship Award while her teammate Cambry Kaylor was recognized with the “The Style Award”. U.S. teammate Kate Shoemaker also had a great weekend earning the highest overall score of the weekend including a 71.7% in the Freestyle Test. The ground jury included Anne Prain FRA 5*, Ulrike Nivelle GER 3*, Kristi Wysocki USA 4*, Mercedes Campdera Alatorre MEX 3*, and Lorraine Stubbs CAN 4*. Each rider attributed to the success of the USA team in this unprecedented event held in Lexington, Kentucky. Chef d’Equipe Kai Handt has coached multiple Young Rider Teams to championships at the NAJYRC but this weekend was his first U.S. Para-Dressage Young Rider Team. 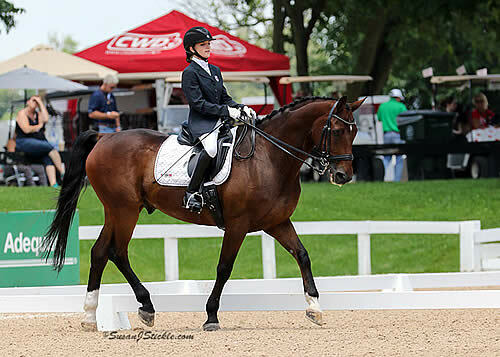 Sydney Collier rode under Handt prior on the U.S Team at the 2014 Alltech FEI World Equestrian Games but at this event she rode her own horse Wentworth. Collier was awarded the The Captain Andrew B. de Szinay Memorial Sportsmanship Award on July 18. The Captain Andrew B. de Szinay Memorial Sportsman Trophy is given to the Young Rider who best personifies the high standards and virtues of integrity, sportsmanship, honor, courage, team spirit, good temper and unselfishness. This award is presented annually by the United States Equestrian Federation in honor of Captain Andrew B. de Szinay who was a teacher, dressage judge, technical delegate and long-time supporter of the Young Rider’s program. His dedication and support has helped the championships become what it is today. In 1989 former U.S. Para-Dressage Chef d’Equipe Missy Ransehousen earned this award. Also presented with a unique accolade was Cambry Kaylor. Kaylor earned the “The Style Award” annually celebrates one rider from each discipline recognizing their “style” throughout the week. Not only while mounted, but also in the form of manners and overall demeanor around the competition grounds and at the organized functions. The panel of judges who voted on the winners included the Ground Juries of each discipline, the veterinarians, technical delegates, FEI stewards, appeals committee and the NAJYRC OC. The U.S. Para-Equestrian Dressage riders’ next competition is the 2015 Katy CPEDI3* October 27-29, followed by the 2015 USEF Para-Equestrian Dressage National Championship held October 29 – November 1, 2015, in Katy, Texas.